You all know how much I love holidays... So whenever I see something holiday-themed, I immediately want it. I've been putting together my Valentine's Day beauty wishlist over the past couple weeks and I thought I'd share my favorites with you. Since I started putting together this list, I've actually bought some of the things, so you can expect full reviews soon! Urban Decay's flavored body powders. I actually have all of these scents in the old-style packaging, but the new style packaging is even better! I am a total sucker for packaging, I know. I'd get them again just to have the gorgeous boxes. I really do like these, they're sweet scented (Cocoa is amazing, I wish it had a matching perfume) and they also taste sweet. The have a little bit of a tinted shimmer. I used to wear them on my chest/collarbone/décolletage when I was wearing lower-cut shirts. Oddly enough, whenever I wore these, this guy I worked with always told me how pretty I looked. 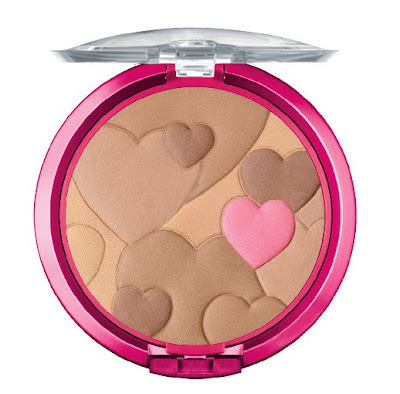 Physician's Formula Happy Booster blush, bronzer and powder. I don't think I've lusted after any beauty product quite like I did with these. The minute I saw them I just couldn't stop thinking about them. I did end up finding these last week and I love them so much. I'll do a review on them shortly, but let me mention that these currently have $3 off coupons attached to them, so if you're thinking about getting one, make sure to get one with a coupon on it! Stila Make Me Blush. I feel the same way about this that I do about the Physician's Formula Happy Booster powders. I know that logically, it's just a blush. But when I see it I go crazy. It makes me giddy to look at. Of course, I caved and ordered the set that comes with the Hugs and Kisses lip glazes. It's actually a pretty inexpensive indulgence- the set is only $20. Philosophy Sweet on You set. One of my readers told me about this! It's supposed to smell like those candy hearts that I love. I have the sweetest readers :) Anyway, I'm a huge Philosophy fan so this is extremely appealing to me. I really really want this! Buttercream and rock candy scented hand sanitizer! Must have these! 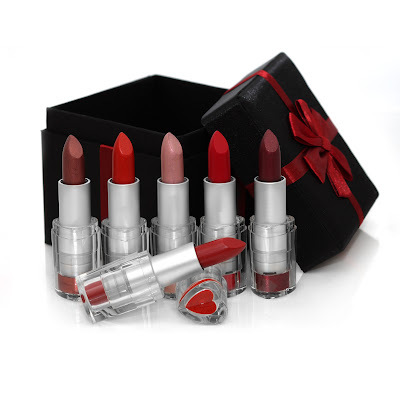 YBF Pucker Up lipstick set. They're in heart-shaped tubes! I remember that Models Prefer used to have a set just like this, and I remember always wanting it. I'd probably only be able to pull off that pink color in the middle, but like I said, I'm a complete sucker for packaging. 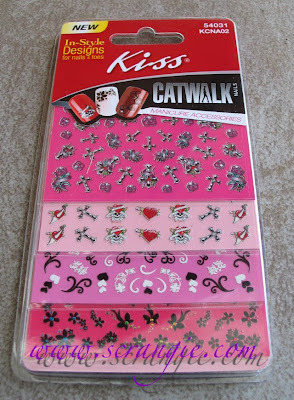 Kiss Catwalk Nail Decals. Actually, this isn't so much a wishlist item as a recommendation. I just got these and they're perfect for Valentine's Day. Just wanted to make sure I mentioned it! Sephora Collection Flower Kabuki brush set. Gah. I can't handle how cute these are. I'm not sure how well they would even work for applying powder, but I need them. Anyone have these? Are they good? I love looking at them. Kat Von D Adora fragrance and Painted Love Lipstick in Adora. Adora doesn't even sound like a fragrance I'd like based on the list of notes (Lychee, Boysenberry, Thyme, Cassis, Hyacinth, Jasmine, Mango Flesh, Patchouli, Sheer Musk, Amber Wood.) but I love love love the bottle. It looks so heavy. And the lipstick? I don't think I really wear red well, but the color of it is so bright and sparkly and look at that romantic looking tube! The red flowers on the black satin background! The little clear base that shows the color! I'm having cute makeup overload. Do not go for Adora! I hated the way it smelled so much, but "Saint" is the same bottle design (but in white) and smells a billion times better. I also have "Sinner" but don't like that one either. 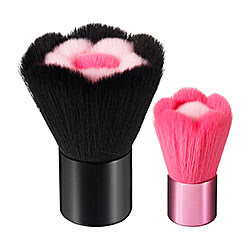 The flower brushes are killing me with cuteness. KvD Adora wasn't for me either. It smelled like one of the EL scents. 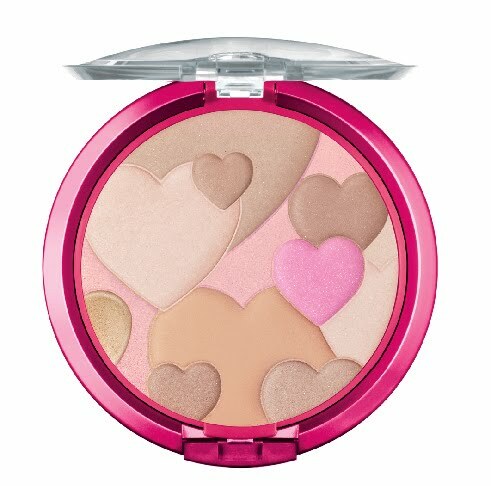 I love the PF blush! I picked it up in Natural. I am SO in love with Adora. I think it smells amazing. However, if you're unsure about how much you'd like it just get the rollerball to see if you like the scent. I know, I know, you like it because of the bottle, but you don't really want to $55 on a bottle of perfume and end up not liking it when there are other scents in the same bottle. Just something to think about. OH! And they have plenty of other colors of th KvD Painted Love lipstick. 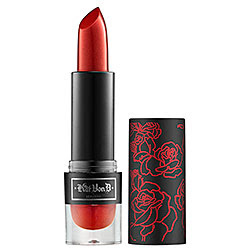 I was also tempted to buy KvD Adora lipstick and about a half dozen other shades of red, but then I had to run away so I wouldn't spend all my money. This post was AMAZING. Now, I have to get my hands on some of these things :) Have I mentioned how much I look forward to seeing your posts?! I know I never comment, but I do always come by and check out what you have to say :) Keep up the good work! I have the PF blush in Natural, and I absolutely love it. It's the perfect shade for my NC20 complexion, and can be worn with most of my favorite lipcolors. Even if I accidentally apply too much, it gives me a "just ran to the mailbox and back" flush rather than "OMG, who left the makeup gun set on WHORE?" Temptation abounds! I definitely have to go look for those lipsicks. I'm a sucker for them as I am for nail polish. I am DYING to try the Physician's Formula thingies too....too cute. I loooove anything with hearts! Have you tried Missha polish? The bottles are heart-shaped! 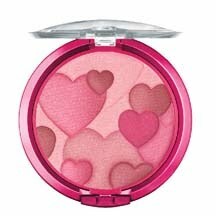 I have the PF blush in rose as well as the translucent powder.... LOVE! 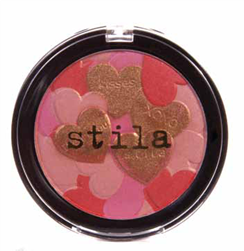 I also got the Stila blush.... before I used it I used a cotton ball to remove the gold overspray... otherwise it is a really funky shade the first time you use it. The gold wipes off super easy. It's really a gorgeous blush when you get down to the actual product. I have the UD Honey body shimmer in the old packaging, and these are cute, I wish they would bring back the old flavors! They had red hots, gimlet (gimlet, which I'm not sure what it tastes like), blackberry, champagne, peppermint... ugh!!!! so many flavors!!! i love the flowerbomb scent from Viktor and Rolf. It is my favorite scent.